In an earlier post I showed how one could address the raspberry GPIO pins, in fact that is quite straightforward given the fact they are digital I/O pins that either are HIGH or LOW. But what if one wants to read a sensor like a DHT11 attached to one of the GPIO pins? That is also not so difficult, but to make it more all round and easy to use in OpenHAB, I wanted to read a sensor and then MQTT the result to my MQTT broker. In my case, my MQTT broker is on the same raspberry that I also aimed to attach the DHT11 to, so if I wanted I could read it directly, but just in case I wanted to read it from another raspberry, MQTT is a better solution (for me). As it is no use to re-invent the wheel, I fortunately found someone already had done most of the work, albeit for a DHT22, but that was easy to alter. For the next steps I presume you already have python installed. Jessie already should have python 2.7 installed, and should you want to upgrade that, check here. The Python program calls a few libraries that you most likely already have, maybe with exception of the paho.mqtt.client and the adafruit DHT library. The mqtt client is now installed. If you already had modules installed those will be skipped. At this moment it is a good idea to restart your raspberry. If you want -when your raspberry is back up and running- you could now try one of the example programs in the Adafruit DHT library, just to make sure everything is working. Connect your DHT11 to e.g. GPIO4 of your raspberry. Now download the DHT_sensor program. Presuming you saved the program as “mqtt.dht.sensor.py”, that is the name you need to use instead of “mqtt.channel.py” (the name mentioned in the “Usage”). 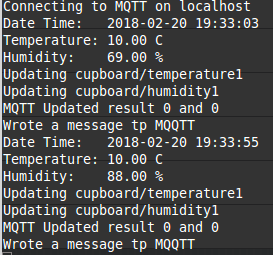 This says that as my mqtt topics I have cupboard/temperature1 and cupboard/humidity1 and my DHT11 sensor is attached to GPIO pin 4 while the refresh rate is 300 seconds (the default). That does the same as the earlier line, but now I set the refresh rate to 50 seconds. I put it in one file because that is easier to type. If you want you can make the dht.sh file to automatically start at boot as I describe below. 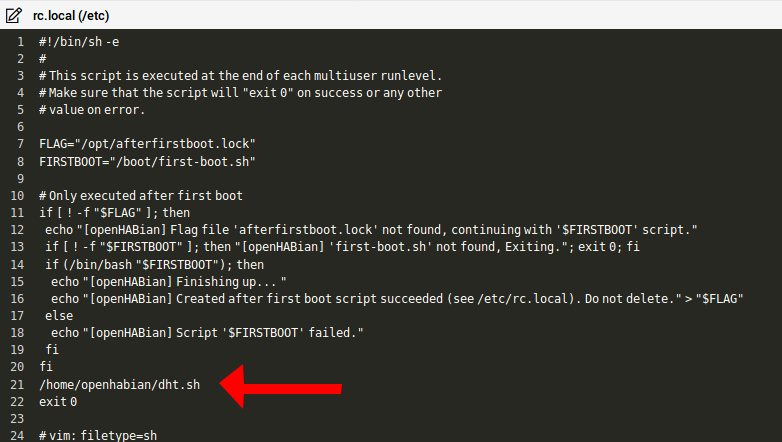 The script will run perfectly when started manually, but it will run in an instance of the SSH window and the moment you close that window, the script will stop. It is therefore better to have the script starting at boot. This is simple to do, but you have to be aware of the full PATH you are using. Save the file and reboot. You will now no longer see the temperature and humidity in an ssh window, but the MQTT commands are being sent. If you are eager to test the program, before you connected a sensor, it will just skip the sensor and you will get no useful feedback. Most likely you are running the file from another raspbery where your MQTT server is not located. Make sure you alter the variable ‘servername’ in the mqtt.dhtsensor.py file into the servername or ip number where your mqtt broker is situated. Also make sure you do not have two clients running with the same name. IFTTT is a real handy service that allows you to make applets doing a variety of things, like email you the weather update every day. 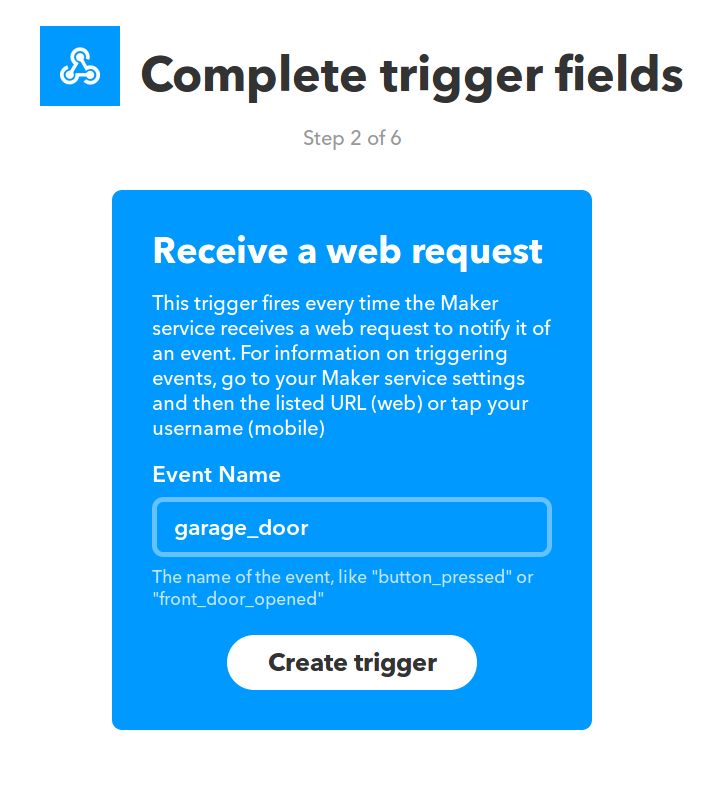 Also, most home automation services like ‘Openhab’, ‘NodeRed’ or ‘HomeAssistent’ have a link with IFTTT so you can use your own data to trigger events or have have IFTTT take action in your home automation application, like switch on lights. But, what if you dont have a homeautomation system and you just want your individual lonely arduino with ethernetshield to trigger something in IFTTT? So after getting myself re-aquainted with it, it might be good to share that with people who are interested in using it. 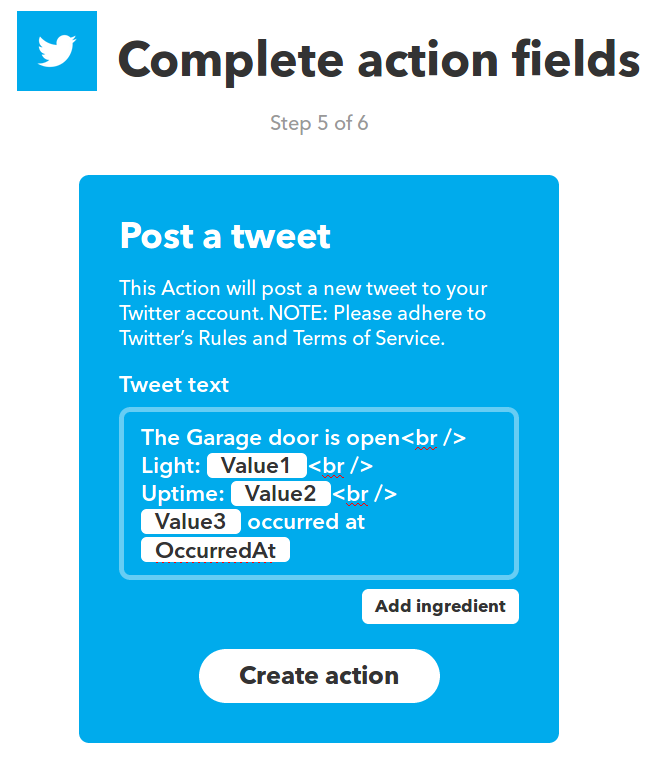 Therefore, let’s make a program that uses IFTTT to Tweet data every time the garagedoor is opened. Yes I know, you can tweet directly from an Arduinoprogram as well, but that’s not the point. First ofcourse you need to register for IFTTT if you haven’t yet done so already. Then you create a new applet and for the “IF” service, you choose “webhook”. If you never have used webmaker before, it will ask you to connect that service and provide you with an API key. Store that one, you will need it. In Step 2 it will ask you for an “event name”. this is a free to choose name that we will use later to trigger the event. Let’s make that ‘garage_door’. In step 3 and 4 we chose the Twitter action. If you never used twitter before with IFTTT, you will now be asked for authorization from Twitter. In Step 5 we format the message that we want to Tweet. The picture shows how I have done that. in which “d56e34gf756” should be replaced by YOUR apikey. Within moments you should see your tweet appear in your timeline. So all we need to do now is to have an Arduino make a POST or GET webrequest akin to the one above. You will find the code belonging to this action on github. First of all, install the GPIO binding in the PaperUI. After one has done that, there isnt really much else to do on that binding. There is no services/gpio.cfg although some of the documentation mentions that file. That’s basically all one needs to do. Let’s setup an ‘input’ which in openhab is a ‘Contact’ and an ‘output’, which in openhab is a Switch. In fact, those are the only states the binding allows. Let’s pick some pins to use. It is easiest to use pins on the Raspberry header that are close to a ground pin. 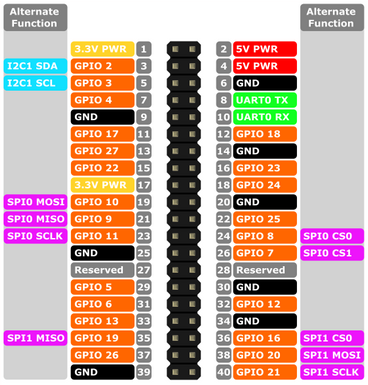 Looking at the pin out of the raspi, we see that for instance GPIO pins 21,13,5, 7, 10, 27,22,24,25,12,16,26, 3, 4, 8 and 17 are next to a ground pin, but some of those have reserved functions so i stayed away from those. The group ‘LivingRoom’ is not mandatory if you have defined your sitemap and of course you may use another group that suits you more. But with ‘force:yes’ we force the use of the pin even if it would have been in use by another process. Obviously that might not be the most elegant way to do it, but as i am pretty sure I am not using it for another process, I just wanted to make sure Openhab would have the pin available. The current of a GPIO pin is far to small to drive any significant load as it can deliver some 60mA I think. The configuration allows for some other parameters. initialValue:high:low determines the state the pin will take during initialisation. I will not go too much into the benefits of a Watchdog timer as I presume those are known, but in short a Watchdog timer resets a processor when it hasn’t seen any activity of that processor for a while. This is specifically handy for processors that are in a less accessible space, where otherwise you’d have to go to, get access and press reset. Basically there are 2 types of Watchdog timers: Hardware and Software. About Software WDT’s I can be brief, they work, but as the very goal of a WDT is to reset in case of software failure, using a software WDT seems a bit counterintuitive. If however you opt for a software timer, you will find a good article here. Many of the Atmel chips, such as theAtmega328 in the Arduino UNO have an internal hardware Watchdog timer. In reality that watchdog timer is just a simple counter that gives a pulse when it counts up. 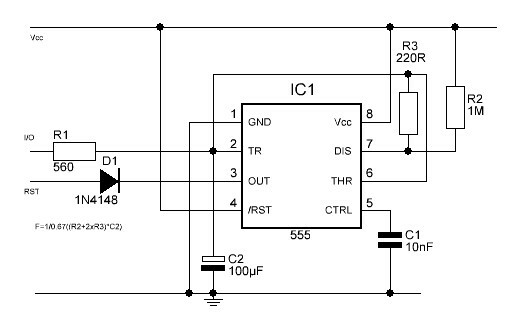 This pulse can be used either to generate interrupt or simply reset MCU (or both). The watchdog timer can be reset to zero at any time with the WDR command. The Internal Watchdog timer of the Atmeag328 is set by by programming WDTON fuse when flashing the MCU. You will find more information here. Other than having to set fuses when flashing your chip, this internal hardware timer has a drawback similar to the software WDT: If you make a mistake, your chip could get into near continuous reset which makes it hard to re-use it again. From that point of view an External Hardware WDT might be a better option. If you dont need it anymore, or made a mistake, you simply disconnect it. There are specific WDT chips available, but the good old NE555 can be used as well. In this circuit the 555 is configured as an astable oscillator. When free running it will charge C2 till about 2/3rds of Vcc (so about 3.33V) and then generate a negative pulse on pin 3 that is connected to the RST of the Arduino (or other chip). Diode D1 is not essential, but it does protect the Arduino. 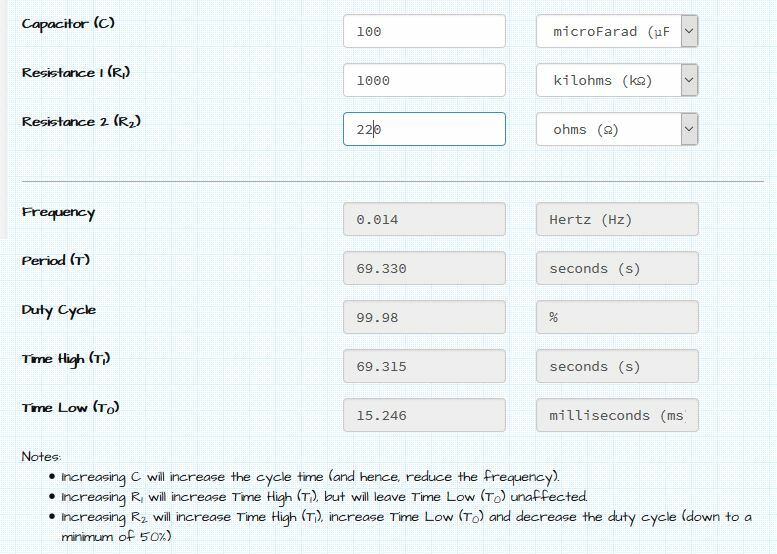 The frequency, and thus period of the oscillator is determined by R2, R3 and C2. In its current config the time period til reset is about 69 seconds. At the end of that period the circuit will generate a LOW pulse that will reset the attached microprocessor. As the dutycycle of the circuit is far from symmetrical (fortunately) the LOW pulse will take some 15 mSec which is a useful time. Not too short, not too long. However, we do not want the processor to restart every 69 seconds, we just want it ro do its thing unless it hangs and therefore we let the processor restart the 555 oscillator continuously to signal that it is still alive and kicking. We do that by discharging C2 via R1 and we do that simply by using an output pin that we make LOW. So if during each loop of the firmware in the processor we pull that Output pin LOW, the Watchdog knows the processor is still doing its work and only when the program hangs, the watchdog will do a reset after 69 seconds. It is not sufficient to just make the Output pin LOW to restart the timer, but afterwards it needs to be set HIGH again. However, even if an output pin is HIGH, there still is an internal impedance that could drain C2. Therefore after setting it as OUTPUT and LOW, we set it back to INPUT mode again, because as input the I/O pins of the Arduino have a fairly high impedance. // Send an initial heartbeat. 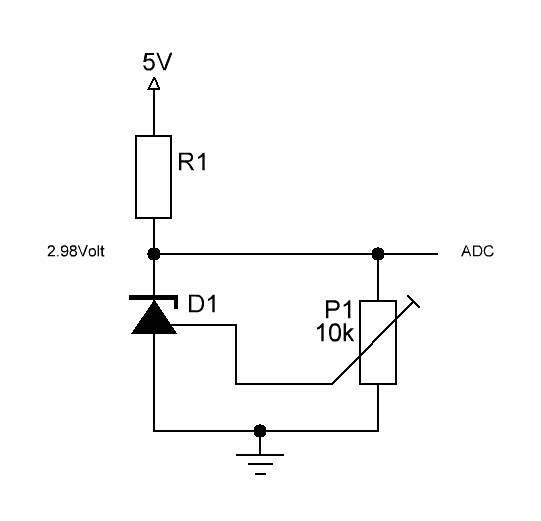 Reverse polarity protection can easily be done with a single diode. The problem with that however is the voltage drop (usually 600mV) that with large currents can mean a substantial powerdissipation. Using a Skottky diode for its smaller voltage drop is risky as the reverse current through a Skottky is not negligable. 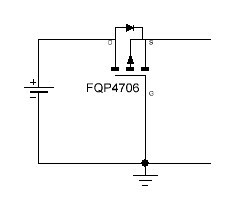 A better way is to use a P-MOSFET as shown in the circuit above. This method is explained very well in an Afroman youtube video. Though the direction of the P-Fet may seem a bit counterintuitive, but realise that when the Vgs is in conductive range, the FET will basically operate as a Switch or in fact a resistor with very low resistive value, allowing current in both directions. However you need to pick a FET with low VGS(threshold) so that the device is still offering a tiny volt drop at low battery voltages AND you’ll need a FET with low RDS(on) so that at your peak current the FET is dropping less than say 100mV. Other than the FQP4706 the DMG3415U may be a good pick. With 1.8V gate drive it has 0.071Ω resistance. Gardeners who use a resistive moisture sensor to measure the moisture of the soil, sooner or later get faced with corrosion of their metal sensor. Though practically all metals corrode in the soil, in this case it is sped up by the fact that a current flows through the sensor, causing electrolysis. Several solutions are suggested to solve that like: ‘you have to feed them with AC’ but those solutions are not always practical. There is however a fairly simple method to minimize the electrolysis and that is to switch off current through the sensor when you do not need it. Moist soils do not need constant measuring, maybe 3-4 times a day is enough, so if you switch off the sensor except for the say 3x a milisecond or so that makes a big difference. Easiest might be to use an I/O pin to feed the sensor, but not everybody feels comfortable doing that and not all microcontrollers are suitable for that (although the arduino probably is with 40mA per pin). But it is in fact quite easy to use a transistor -controlled by an I/O pin- to switch the sensor on and off. Figure 1 gives an example of how to do that with either low side switching or high side switching. Figure 1a is a very basic transistor switch: Pull the base of the transistor HIGH and current will flow through the sensor, pull it LOW and the current will be switched off. Remember there will be a slight voltage drop (say 250-450 mVolt) over the transistor. Fig 1b is also a rather basic transistor configuration, it is the emitter-follower or common collector that is often used in voltage buffering. Here also a LOW on the base will switch the transistor OFF and a HIGH will switch it on. Also here one has to take a voltage drop into account (basically the voltage on the I/O pin minus 0.6 Volt). Mind you that Fig 1&2 just give a basic circuit. You’ll need to add a base resistor and possibly a pull-down or pull-up resistor, depending on what state you want the circuit to start in. Figure 2 shows two other circuits you may be considering to try, but that’s not necessarily a good idea. Fig 2A is basically identical to Fig 1A, but with the sensor and series resistor switched position in the voltage divider. That does not work because even when the transistor is switched off, there still could be a current flowing through the sensor via the internal impedance of the microcontroller input. Mind you that Fig 1 and 2 just give a basic circuit. You’ll need to add a base resistor and possibly a pull-down or pull-up resistor, depending on what state you want the circuit to start in. The LM335 belongs to a range of a fairly accurate and simple to use temperature sensors. 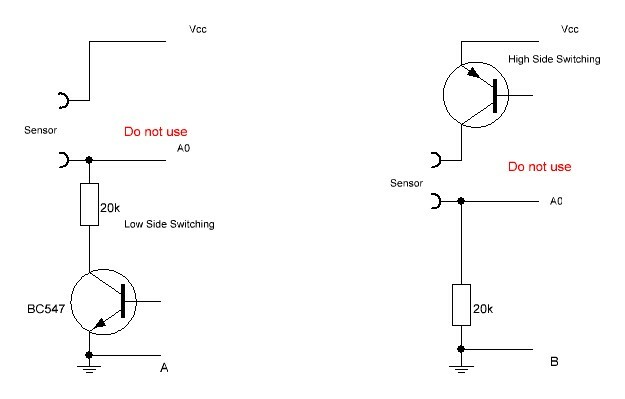 According to the datasheet, the potentiometer needs to set the voltage over the LM335 at 2.98 Volts at 25°C (¶ 6.4 in the datasheet). The LM335 needs between 400uA and 5 mA (¶ 6.2 in the datasheet). Suppose that the max temperature we want to measure is 30 C (=303.15 °K). The output then will be 3.0315 Volt (let’s say 3.03 V). At 3.03V the current through the 10k potentiometer will be 3.03/10k=303uA. The minimum current that needs to flow through the LM335 is 400uA, so R1 needs to supply 703uA over a voltage of Vcc-3.03V. (Note 703uA= 0.703mA = 0.000703A. I chose to divide by mA so I get outcome in kΩ). Let’s say our minimum temperature is 0°C that is 273.15. At 10mV/°K that means an output voltage of 2.73 Volt. At 5 Volt the resistor current will be (5-2.73)/2.8kΩ = 810uA. We still need to subtract 2.73V/10kOhm=273uA which flows through the potentiometer so we have 810-273=537uA, which is well below the 5mA max. The resistor current will be (3.3-2.73)/384=1.5mA. Subtract 273uA that flows through the potentiometer and that gives roughly 1.23mA, well within limits. If you want to measure temperatures higher than 30°C then R1 has to be smaller. When using 3.3 Volt the theoretical maximum temperature measurable is 330°K which is about 57°C. 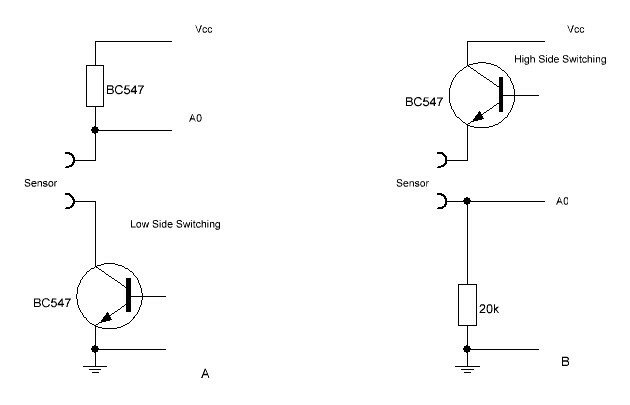 In practice however that does not work as you need a drop voltage over R1 so the value of R1 cannot be zero, or, in other words: you cannot connect the LM335 directly to Vcc and still expect to get an output lower than Vcc. Well again you need 703uA but this time over 0.07V. That gives a value for R1 of 100Ω. But then at 0 degrees the current is 5.7mA. Still need to subtract 2.73uA which gives 5.4mA which is out of spec.